Keep an eye on this website for details as we announce them! It may be a little while as it is no simple matter to put a new show together. We are currently aiming to be ready for the autumn. Bios for our new band members will be added soon! 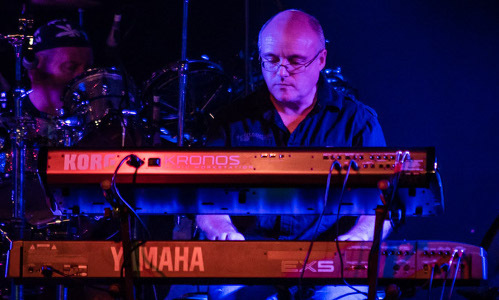 Derek is our Keyboard player, providing those lush Rick Wright textures to provide the sonic foundation over which those iconic guitars can soar! Derek's influences are diverse and wide ranging - extending from classical to punk to even Hebridean folk music. The intersection of all of those influences is progressive rock and bands like Pink Floyd (of course! ), Genesis, Yes, Rush, Camel ... and also modern progressive bands like IQ, Spock's Beard, Porcupine Tree, Moon Safari and so on. A teenage interest in electronics led to an interest in Synthesisers - thanks to an 'accidental' purchase of "Electronics and Music Maker" by his Dad instead of the usual "Everyday Electronics", which had circuit digrams for building synths and articles on bands like Ultravox. This was around '78-'79 when Derek's own musical interest was awakening. The seminal moment of musical discovery came in '79 when BBC Radio One's Friday Rock Show played a "listeners' all time top ten", where Derek heard bands like Yes and Rush for the first time, and was totally blown away by such music that he had never heard before! And of course '79 was the year that "The Wall" was released, which introduced Derek to Pink Floyd. 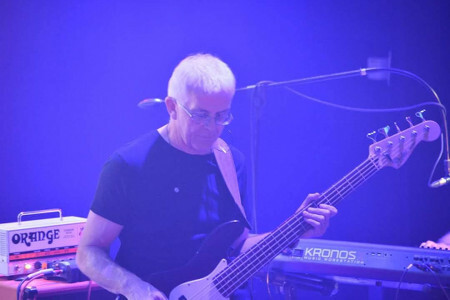 Derek uses Yamaha and Korg keyboards, Roland Amps and Foot Controllers, and a vast plethora of computer hosted "virtual instruments" to recreate the classic Rick Wright keyboard textures that are an essential part of the classic 'Floyd sound. 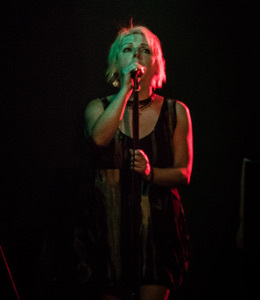 As well as gigging in Welsh Floyd, Derek also writes original music in Echoes (which he hopes to resurrect one day, as local music fans sill ask about when he will do it again), Carreg Ddu (original "Celtic, progressive ambient"" music) and Spectral Streams, which is a vehicle for a more experimental electronic style of music. Martin is a very accomplished bass player, he started playing bass the age of 15. He started off playing a six string guitar and then was asked to take over on bass and thus the relationship with the low end rumble began. He's a been a fan and heavily influenced by Pink Floyd. He says he can remember his brother’s friend had brought over ’Meddle’ and ’Piper At The Gates Of Dawn’ sitting in front of his Mum’s radiogram and hearing ’ One Of These Days’ for the first time and have been inspired by Roger Waters ever since. Martin’s favourite album is ’Dark Side Of The Moon’, which is a good thing really as it’s now a main part of our set. Martin’s musical career has seen him playing in many bands, including a few original recording and gigging bands that supported bands such as Saxon and Girlschool. Martin uses Fender Jazz 4 and 5 string basses, Orange Head and Cabs with Boss FX. Martin’s favourite bassist is Geddy Lee, and his wide influences range from Pink Floyd, Led Zeppelin, Rush, and Status Quo to Chic. 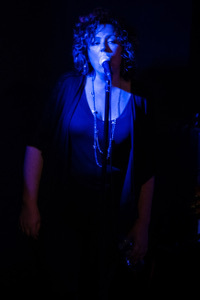 Steph has been singing since she was born, and has a great love of harmonies. I have fronted 2 rock bands and have worked with many musicians and songwriters on original material. I have done a lot of studio work which has given me the chance to be creative and very versatile. My main influences are mainly through their harmonic prowess. The Beatles, Crosby Stills and Nash, Simon and Garfunkel and The Byrds. I also love different rock styles such as Led Zeppelin, Peter Green, Fleetwood Mac, T. Rex, The Band, the list is actually quite endless! If you had to one album to your desert island, what would it be and why? Fleetwood Mac’s greatest hits. This is when Peter Green was fronting them. I love many albums so I probably will change my mind quite a lot! Tell us a bit about how you started singing? I started singing when I was in school and always enjoyed it. I took it to the next level when I did my HND in Music Performance, which was where I met Steph. I started by doing musicals, but have done everything from folk to providing vocals to rave music during the 1990’s rave music. If people ask me to sing I’ll give most things a go. If you could take any album on a desert island what would it be? I think anything by Elbow. I think I’m one of those people that doesn’t think I have a particular influence. I do like harmonies and folk music. To be honest, anything at the moment that isn’t the current CBeebies CD that’s currently in my car!